When it comes to holiday shopping in Milwaukee, we’re constantly implored to buy local. Supporting quirky local shops and boutiques is next to godliness, while ordering your nephew the new Harry Potter DVD from Amazon is grounds for a summary execution. 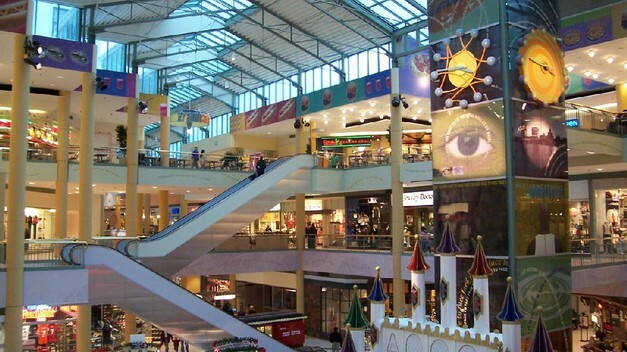 And while keeping things DIY is certainly admirable, let’s face it: At some point during this shopping season, you’re going to end up at a mall. A big, bad, soulless mall where the number of Tolstoy-themed sock puppets made by starving, deserving local artists is frustratingly low. But what if the mere thought of a mall’s crushing crowds, deafening noise, and overwhelming number of quality stores leaves you in a cold sweat? Well, you’re in luck, because The Grand Avenue Mall has absolutely none of those things. From its many shuttered storefronts—the vacancy rate currently hovers at a chilly 30 percent—to its cavernous, tomb-like atmosphere, the downtown mall has garnered a reputation as an embarrassing, desolate wasteland that needs to be scrapped immediately. But is it really that bad? Could it be, in fact, the only place you’ll need to visit for all your holiday shopping needs? Probably not, butThe A.V. Club investigates anyway. The Grand Avenue Mall opened in the summer of 1982. (Yes, we know it’s since been rebranded as “The Shops of Grand Avenue,” but come on, no one ever calls it that.) Though it never achieved the same level of success as its suburban counterparts, it did manage to stay competitive for many years, weathering both a fading downtown economy and the addition of the International Clown Hall Of Fame to its basement. In 1997, however, things started to sour: mall anchor Marshall Fields packed up for more suburban climes, and other stalwarts like the Gap, SunCoast Video, and Sam Goody soon followed. Recently, Linens ‘n Things and Old Navy have both gone the way of the dodo, leaving the once thriving mall about as relevant as Hammer pants. For all your clothing needs, head due east from the cramped, beat up Walgreens and check out Personalized You, where 12 bucks can net you an airbrushed Scarface T-shirt for mom. For more local flavor, Brew City Beer Gear has festive “Ed Gein Lampshades, Inc.” T-shirts ($10), as well a whole slew of other crap covered in forgotten local catchphrases. (“Don’t Whack Our Wiener!”) Finally, finish your shopping spree and experience the ’80s all over again at Radio Shack, where you’ll find in a single store the perfect summation for the entire mall: quaint, off-brand, and more than a little unsettling. After the 10 minutes or so it’ll take you to shop each and every store, you’ll need to eat. Unlike the scant retail choices found on the first two floors, there’s an embarrassment of artery-clogging riches to be mined on the third: Arby’s, Subway, Qdoba, Rocky Rococo, Panda Express, and a full-service Culver’s. A Chocolate Factory lies hidden on the east end of the second floor, while an Applebee’s still somehow manages to survive near the Third Street entrance. Yes, the food court is easily the mall’s best feature, though in a place that counts a Lady Foot Locker among its main draws, that’s not saying a lot. But wait, there’s more! Enjoy the Grand’s shockingly good Westown Indoor Market (every first and third Wednesday through February), or explore the many exotic locales that can be reached through the mall’s intricate network of skywalks: John Hawks Pub! Chase Bank! The Equal Employment Opportunity Commission! Finally, head back to the mall’s Center Court and take in the sub-Chuck E. Cheese animatronics of the Leonard Bearstein Symphony Orchestra (November through December). As you enjoy the perfect end to a somewhat less-than-perfect shopping day, you can quietly reflect upon the sad state of downtown shopping, ponder the pros and cons of buying local, or check your iPhone for Mayfair’s holiday hours (Monday-Saturday: 10 a.m.-9 p.m.; Sunday: 11 a.m.-6 p.m.). Happy shopping!